Language has made many things more easier even in online businesses. YouTube has over 2 million users everyday most people visit YouTube for business, offers, advert, and sharing knowledge. I must say watching tutorials from YouTube make things more easier for you as a webmaster true or false? 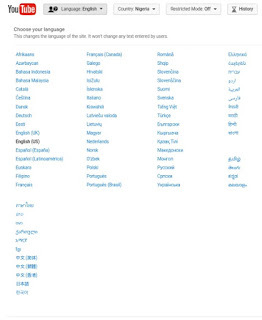 Below is a short guide on how to setup your YouTube language. First go to your YouTube account and move your mouse down to the buttom of that page. Language (English) just click on it. Now you will be given different options with different languages all you need to do is to click on your preferred language and that's all. Now you can now communicate the way you want with different people around the world. ahead and give you a shout out from Atascocita Tx! Very helpful info specifically the last part :) I care for such info much. suggest you some fascinating things or tips. and practice a little something from other web sites. Hi there, I would like to subscribe for this blog to get most up-to-date updates, thus where can i do it please help out. on this space to resolve my problem. Maybe that's you! Looking forward to peer you.